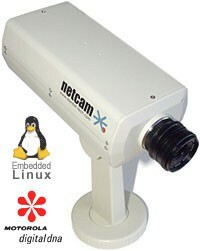 This camera is a self-contained Internet camera which does not require a computer except for the initial setup. It has a built-in computer which will not only serve the images directly from its internal web server, but will also FTP upload images at any interval I chose. The camera has many built-in controls most of which are adjustable from a web browser via its internal web server. While most of the controls are very sophisticated, they are, in many ways, not as easy to use as most consumer type web cameras. Most settings that would normally be controlled by slider bars on other cameras, are instead set with numerical settings with NetCam. While this isn't as easy to manage, it does allow for extremely precise adjustments. The camera comes in two flavors, NetCam standard, with a 640x460 image sensor, and selling for $599, and the NetCam MegaPixel, which I purchased, with a 1280x960 pixel sensor. The basic camera comes with an 8mm manual focus lens. There are numerous other lens focal lengths available and a remote controllable zoom lens which run a bit more than half the cost of the camera. Included with the camera is a combined network/power cable. A nifty feature allowing you to place the camera up to 50 feet from an outlet and your network connection. I had a problem with the weather proof exterior housing I ordered for an additional $129. The company's website doesn't explain the difference between the light duty and heavy duty accessory housings. It turns out the light duty housing has some ventilation holes which could allow some rain to get into the housing during a heavy wind storm. I would assume the heavy duty housing solves that problem, but it's $90 more than the light duty one. One difference between this camera and most of the other self contained IP style cameras is this one contains a programmable computer. The camera is extremely flexible if you know how to program in uClinux, because you could, in theory, completely rewrite the coding which drives the camera. From some minor research on the net it would appear that uClinux is a fairly simple language. But, if you don't know this language, you are stuck with the settings available within the built-in screens. However, there are quite a few settings available. Just take a look at the specs page on their website, and the example control pages below. I was especially pleased with the exposure controls, an array of check boxes to chose the areas you want the camera to watch for auto exposure control. The camera will also automatically adjust the iris of the optional zoom lens in addition to basic electronic brightness control. Another pice of good news is the quality of the images. These pictures are outstanding. Many of the web cams I have on my webcam links page are StarDot NetCams. Check out the Yosemite cameras. One of my disappointments was in the frame rates. The frame rate is rather slow compared to cameras you plug into your computer. At 320x240 (the size of my example images) the refresh rate is 1 frame per second. Not too bad, but at 640x480 only one frame in 3 seconds and with the mega pixel 1280x960 only one frame per 8 seconds maximum speed. It is actually slower than that if you have the camera doing much in the way of uploading images via FTP. But then I have to accept the slow frame rate because the quality of the image is fantastic. Another problem I had was with some of the instruction manual pages. For example, the specs page on the website says you can control the focus of the zoom lens from your computer, an important factor in my deciding on buying the expensive zoom lens. It turns out that you have to use Telnet for this (Windows Hyper Terminal) but nowhere do they tell you what commands to send to the camera. I had to e-mail them and ask. I felt, for the price, focus should be available through the web interface, or at least as a cgi command which is the way the zoom works. Another problem came when I tried to push the included cable through the compression coupling of the "gland nut" (water proof cable entry port) for the weather proof housing. The cable, which has a hard plastic molding where the power and network cables come together, will not fit through the nut which is also hard plastic. I had to shave layers off the plastic molding with a razor knife to get it to fit through the nut. I managed to cut myself rather badly in the process, which of course was my fault. I do know better than to use a razor knife that way, but I was a bit frustrated and became careless. Note on the TelNet focus command for the zoom lenses. The language is case sensitive. Each represents a single space. The numbers in the following commands refer to milliseconds. In this example the lens focus motor will run in the indicated direction for 7000 milliseconds.